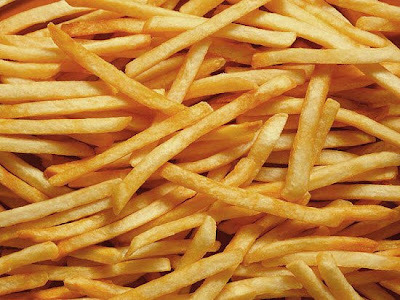 Weighty Matters: Is "vicarious goal fulfillment" to blame for that order of French fries? Is "vicarious goal fulfillment" to blame for that order of French fries? We've talked about health halos before - if you think a food's healthy you're more likely to consume larger portions of it. Things like "low-fat" front-of-package claims and even restaurants (Subway) have been shown to have health halos that lead to less healthy consumption patterns. This one has to be the strangest health halo yet. This one states that if there's salad on the menu you'll be more likely to order the fries. In this study, when menu choices included healthier ones individuals were more likely to choose less healthy options than when the exact same menu was provided minus the healthy options. When salads were on the menu, fries were eaten more frequently, bacon-cheeseburgers when veggie burgers were available, chocolate covered Oreos when 100 calorie packs of Oreos were present etc. In fact there was not one menu in this study with which this phenomenon was not found to occur. The researchers called the phenomenon, "vicarious goal fulfillment" whereby the mere ability of being able to meet their goal of eating healthier actually caused individuals to feel that they had already met their goal and therefore could order the less healthy, more indulgent option. Wow - brains are crazy places.